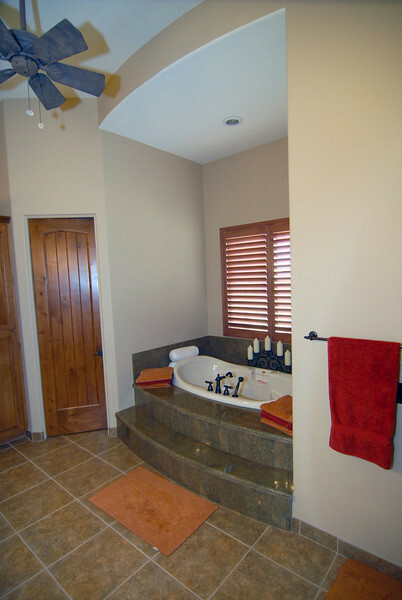 ← THREE POPULAR INTERIOR TRIM STYLES IN ARIZONA CUSTOM HOMES! Granite, in a warehouse is usually stored in large four-by-eight foot slabs ¾” or 1 ¼”. Once a custom home buyer has made the basic selections from the showroom or design professional’s samples, the actual selection process begins. Custom home buyers walk through the granite supplier’s warehouse and hand pick the slabs they want for their home. By then, the fabricator has calculated the number of slabs necessary to complete the job. Once the customer selects the actual granite slabs, those slabs are removed from the warehouse and stored until needed by the fabricator. Granite can be priced fairly reasonably or be very expensive. Granite is priced by grade, the lower grade costs less and usually has less veins. It does not mean it is of lower quality. Usually the more venous a granite style is, the pricier it becomes. The deep veins of the azures and blue shades have been particularly pricey for some of our customers. The more veins a slab has, the more difficult for the counter top fabricator to match these veins for the most natural look. It takes more granite to complete a job because of matching the veins, so the costs increase for two reasons, 1) venous slabs are usually priced higher, and 2) it takes more granite slabs to complete the job. Since granite can be an expensive amenity in the custom home, at Woodridge Custom Builders LLC we encourage our custom homebuyers to make reasonable grade selections. We also recommend to our custom home buyers that they limit their granite selection to one variety. Since granite is purchased in four-by-eight foot slabs, if a small bathroom vanity counter top is all that is required, we must still buy an entire slab. Choosing Baltic brown in the kitchen, Black Galaxy in one bathroom, and Rocky Ridge in another bathroom requires the purchase of three different slabs. One slab is not likely enough for the kitchen, and one slab for a bathroom is likely too much granite. Granite is a great amenity for the custom home. Its high durability, scratch, burn, and crack resistance, make it one of the best selections for counter surfaces. Our custom home buyers usually enjoy making these selections, specifically walking the granite warehouse and handpicking the pieces for their homes. The granite in the first photo contains more veins than other granite types. 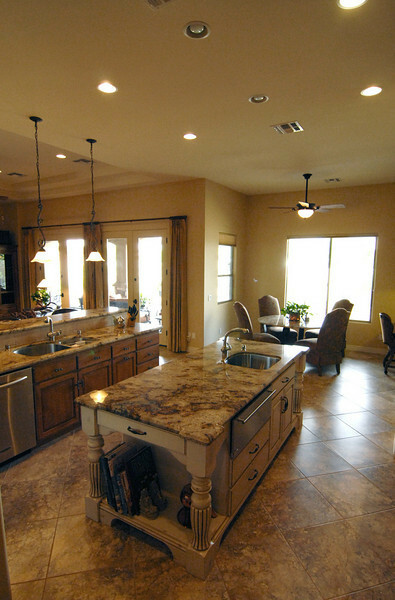 This stunning kitchen coordinates flooring, cabinets, island cabinets, and granite colors. The granite in the second photo has fewer veins than that in the first photo, matching very nicely the vertical pieces across the circular shaped tub decking. This entry was posted in arizona custom builder, Arizona custom builders, Arizona custom built home, arizona custom homes, arizona general contractors, Arizona home builder, Arizona home builders, Arizona luxury home builders, Arizona luxury homes, Chandler, Custom builders, custom built homes, custom home, custom home builder, Fountain hills, gilbert, granite countertops, kitchen countertops, kitchen countertops granite, Paradise Valley, Phoenix, rio verde, scottsdale, tempe and tagged arizona custom builder, arizona custom builders, arizona custom home builder, arizona custom home builders, arizona custom homes, arizona general contractors, Arizona home builder, Arizona home builders, arizona homes, Arizona luxury home builders, Chandler, custom built homes, custom home builder, custom home builder in arizona, custom kitchen islands, Fountain hills, gilbert, granite countertops, home design, kitchen countertops granite, luxury home builder, Paradise Valley, Phoenix, rio verde, scottsdale, tempe. Bookmark the permalink.